Loewe is another emerging brand in the market that’s known for giving their customers only the best – with that being said, we’re going to show you their Elephant Mini Shoulder Bag, a one-of-a-kind piece that’s sure to brighten up your day! Like who wouldn’t get to smile at the sight of this cutie? Exactly! The brand has long been known to produce fun and whimsical pieces, creating different shapes of wallets and other leather goodies. 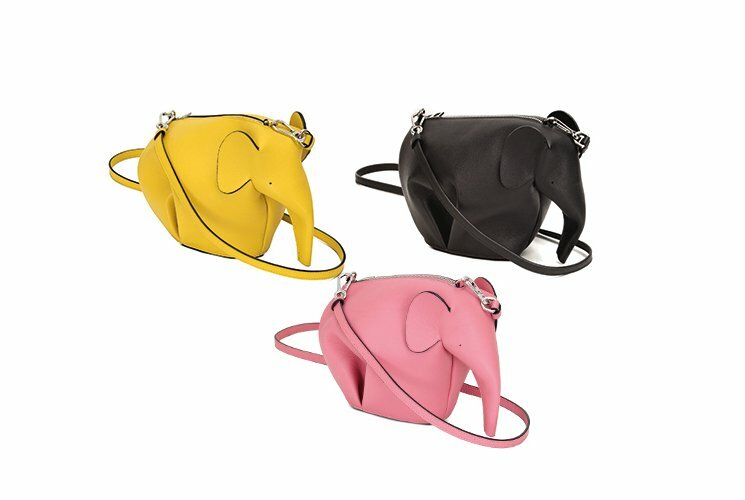 But did you know that the Elephant Mini Shoulder Bag came to be as…an accident? That’s right – a skillful craftsman from the brand’s studio initially created leather bears (well, how original…). He then used a similar technique to create other animals such as bulls, and these pieces eventually were made for sale. It was designer Jonathan Anderson who decided to focus on the elephant, adding some functionality to the piece, and eventually, it came to be what it is today. It now comes in an array of colors and sizes to choose from, creating its own branding in the market. Well done, Loewe! It’s such an adorable bag to have! Priced at $1,150 USD or €890 EUR, you can get your very own Elephant Mini Shoulder Bag now via Loewe e-store. Why It’s the Bag of the Week: With over 160 years of expertise in leather accessories, Loewe used beautiful techniques to fold this wallet into an elephant. With the holidays approaching, what better white elephant gift than a pink leather elephant? Today, we are here for the love of cute stuff! Presenting, the Loewe Mini Elephant Shoulder Bag, another lovable piece that’s sure to make you squeal with excitement. If you thought designer couldn’t get this adorbs, think again! This baby is bound to make all of your kawaii dreams come true…in a distinguished, chic way of course. Made with only the finest calf leather, you won’t have to worry about this baby enduring some long years of use, taking proper care and storage into consideration, of course. Measuring 20cm x 15cm x 15cm, you shouldn’t underestimate this baby since it can pack-on enough stuff to get you through your day. It even comes with a detachable strap, which makes carrying a breeze. You’ll never know what hit you ‘til you see this baby for yourself. Priced at $1,150 USD or €890 EUR, you can get your very own Mini Elephant Shoulder Bag via Loewe e-store. Burberry is a chic fashion house that’s dedicated to giving us only the best designs we can ever imagine. Today is no exception, since we’re going to present to you the Canterbury line of wonderful bags. If you love classic, textured pieces with an attitude, then we highly suggest these pieces! You will surely love the bags we’ve got in store for you. We’ve reached the end of our list? Did you enjoy the spectrum of colors for this particular line? We sure hope you did!